A truly great device, the Rooster is capable of enhancing every stage of the recording and mixing process. Its excellent tone-shaping abilities. Superb build quality. Valve warmth from super clean to punchy distortion. 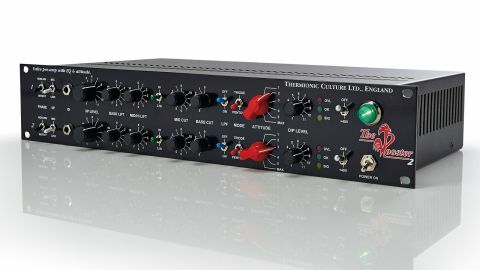 Thermionic Culture has carved itself an excellent reputation in the pro audio world with its valve-based designs. The Rooster 2 is the latest in a long line of innovative units combining high-quality signal paths with the addition of subtle to not so subtle valve distortion characteristics. The Unit features two channels of mic/line/DI pre amplification with a simple but broad EQ section and extra tonal control via a combination of Triode/Pentode switching and an Attitude (distortion) control. Mic, line input and line output XLRs are to be found on the rear panel of this 2U rack mount unit along with the IEC mains socket, and everything else is exactly where it should be on the front. "Without going into distortion it was possible to really affect the overall tone of every sound we put through it"
First up there are two toggle switches: one for phase reverse and the other to switch between mic and line inputs. Next to these comes a 1/4-inch jack DI socket. Patching into this high impedance input bypasses the Sowter input transformer and feeds directly into the valve input stage. Next comes the Input Gain control and this is followed by the EQ section. This has a bass lift with a varislope curve peaking at 60Hz followed by a Mid/High lift which works in conjunction with a three-position switch. At 2.5kHz and 4kHz this has a bell-like character and in the Hi position it's varislope peaking at 12kHz. Mid Cut is a bell curve centred at 700Hz and Bass Cut is a five-position switch which at lower settings acts like a high-pass filter and goes higher in frequency as it turns into a shelving type curve at higher settings. Finally, there is a switched low-pass filter to reduce harsh high harmonics when hard distortion settings are used. Next comes a toggle to switch between Triode (second order harmonics) and Pentode (third order harmonics) and a six-position Attitude switch followed by an output level control. Each channel also has a big latching phantom power switch and on the far right is the mains power. Fortunately the Rooster arrived just as we started tracking an album so its first task was on a pair of ribbon mics on drum ambience duties. With the EQ set flat, triode selected and Attitude set to 1 it gave a lovely clean valve warmth. Flicking to Pentode thickened up the low mids and by switching Attitude to 2 it started to sound fat. With a touch of 2.5kHz on the EQ and some mid cut the snare started to come forward and it felt like a subtle compression had been added. Pushing it into distortion and going back to Triode it was possible to crank up the aggression without harshness becoming an issue and with Pentode it could go as nasty as we wanted. Powerful stuff. On bass DI with judicious application of the bass lift and some extra zing with the 4kHz mid lift we got some great fat, clean tones. Finally on vocals we had some wonderful presence with the high EQ and the bass cut pulled out just enough of the proximity effect to allow the Attitude control to be brought into effect, adding punch and presence with that hint of compression. When mixing we found ourselves running individual sounds and stereo busses out through it. Without going into distortion it was possible to really affect the overall tone of every sound we put through it, especially with virtual instruments. The Triode/Pentode control makes a real difference to the character the Rooster gives and in combination with the EQ and Attitude it's possible to get a massive range of tones and colours. Even though we were doing very different things to each individual instrument or stem, it really helped to blend the elements together in the final mix. From basic recording right through to the final mixing stages, the Rooster 2 is a flexible way of adding real valve character and warmth to your sound. Highly recommended.